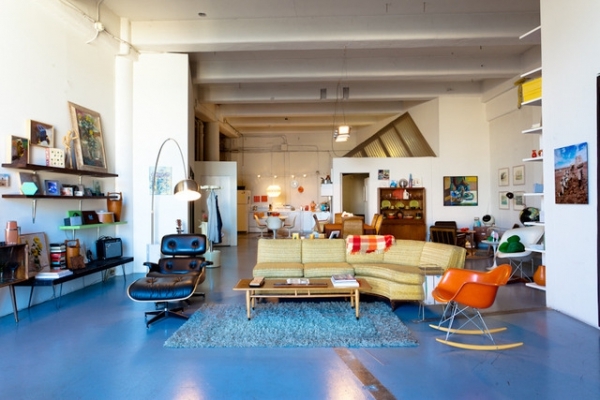 The retro furniture is the star of this open plan loft. The home of California artist Kelly Reemtsen, this gorgeous space has beautiful pops of color and lovely mid-century design. The living room in this open plan loft is bright and airy with its high ceilings, white walls, and concrete floors. A shag area rug designates the middle of the living area, and on top of the rug a wooden table sits. Two Eames chairs add fantastic design and outstanding color to the space, and a retro sofa, adorned with a plaid throw, sits behind the table. A silver modern light leans over the black Eames chair, completing this beautiful living room. White wood beams and industrial lighting wonderfully decorate this home. In the dining area, a retro dining table is surrounded by marvelous brown chairs. The eat-in kitchen continues the modern touches with its white table and white chairs with orange cushions. 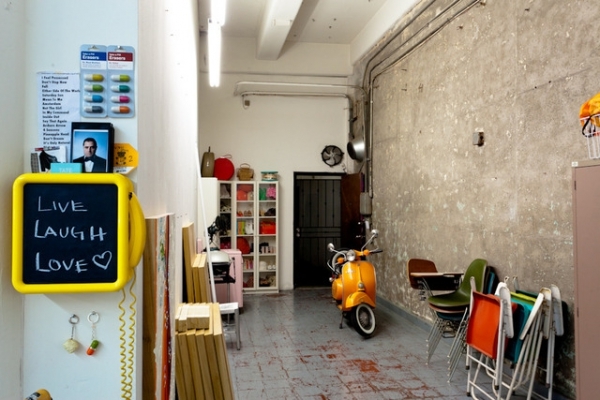 We love the worn floors, they bring even more personality to this charming design. An ornate light hangs over the table, framing the space. 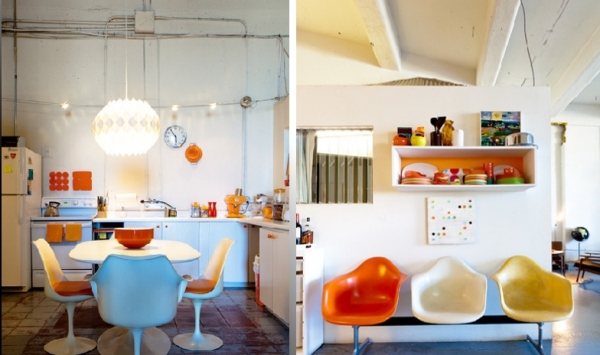 The touches of orange in this kitchen are just perfect, they add a fantastic dose of cheer and playfulness. In this seating area, the chairs continue the amazing colors seen in the other areas of the house. The rugged sections of the concrete floors add interest, and the orange and white shelving provides storage for knickknacks and doodads. We might adore the other seating area, but this one is our favorite. The dark browns really pop in this bright loft. A wooden table sits on a leopard print rug, and three dark brown chairs provide seating. 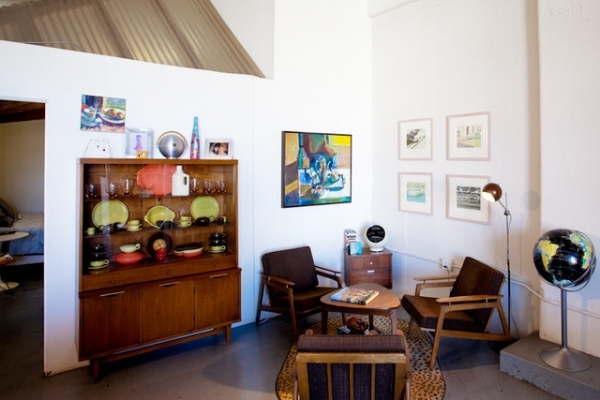 A mid-century cabinet sits against the wall, and dazzling artwork and a black globe decorate this retro design. What do you think? 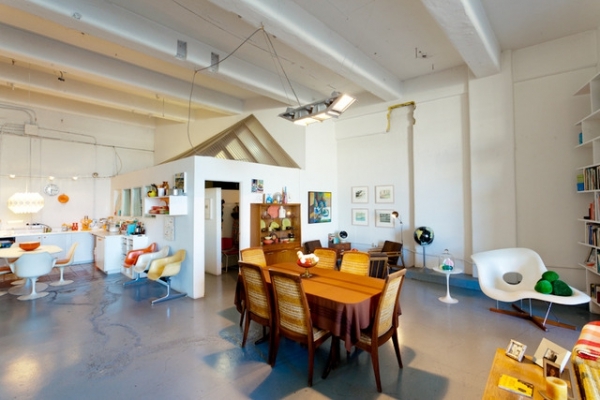 Do you like the retro look in this open plan loft?